I don’t know where I got the idea from, but I suddenly decided I wanted to go on a falafel trek. Ideas kept popping in my mind like the little chickpea balls deep frying away at a crackling rate, waiting to be devoured by me. I needed a wingman on this though. Brave food blogger I may be, but I could not think of doing this alone. But then…I remembered…her. The woman whose love for falafels are so legendary…the woman who has nicknamed herself “Falafil”…the woman who can wax eloquent about the little balls as easily as I can talk about chocolate and cheesecake…I give you: my friend Farah aka Fud aka Falafil. She also threatened me to spell it ‘falafil’ not ‘falafel’ or she wouldn’t join me on what was really her Holy Grail quest. 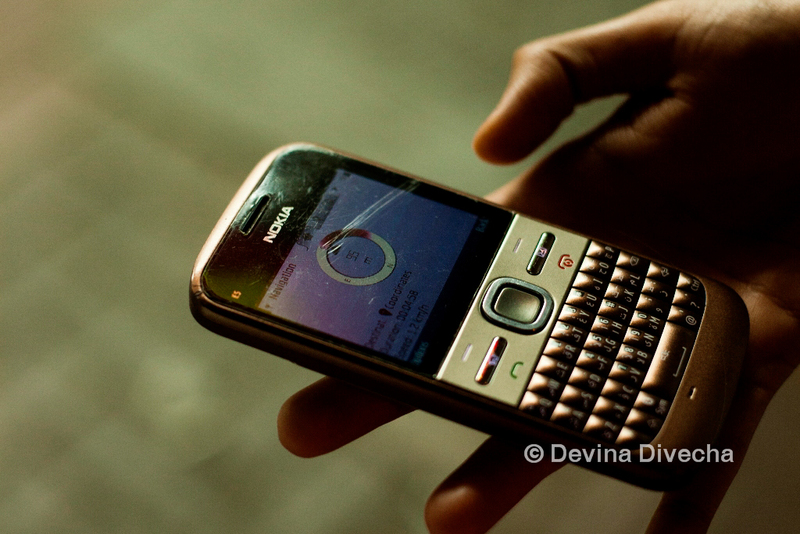 And she’s also my hand model for this post (except for the first image up there…that’s me). I picked her up and we headed off to Bur Dubai. 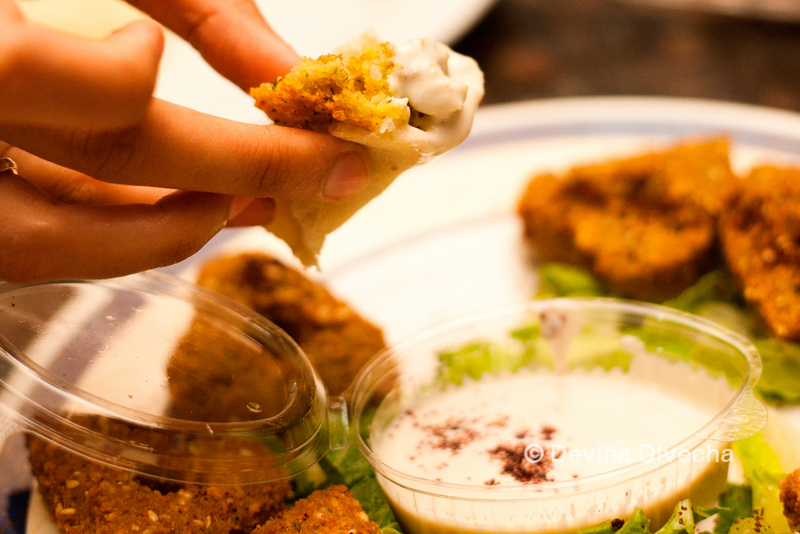 I’d already gotten takeaway from Hummus Wa Falafel (Fud, I can’t change restaurant names!) on Jumeirah Beach Road to get to her, but it had gotten to a tepid state by the time I got to her (Oh Dubai traffic, woe is me). In any case, you get 9 pieces for Dhs 8/- which I thought was pretty good. I had one when it was piping hot and had to admit, it naturally tasted better when hot than cold! Farah wanted more salt in it and thought its consistency could be better, but agreed it wasn’t a fair assessment as she got it when not too hot [Location]. Then our real adventure started. We got parking near the Al Rafa’a Police Station opposite the Ghubaiba bus station, and then started walking. We’d heard of a little stand hidden away in the streets of Bur Dubai with no one able to tell us the name or the location. Extensive googling gave us the name Farisian or Pharisian depending on which website you looked at. Farah, who couldn’t find her way through Dubai without a map anyway, pulled out her phone, switched on GPS and we inputted the location in there. Like thirsty folk holding a water diviner stick, we trawled the noisy, bustling streets of Bur Dubai, which makes me think of being in an equally bustling street in Bombay. Smells attacked us from every corner. I could smell chicken tikka, fruity juices, the searing meat from a shawarma top and so much more…at the back of my mind, I’m mentally slapping myself for thinking of sticking to a veg item. The water diviner…uhhh…her phone eventually showed the distance between us and our quest going down. 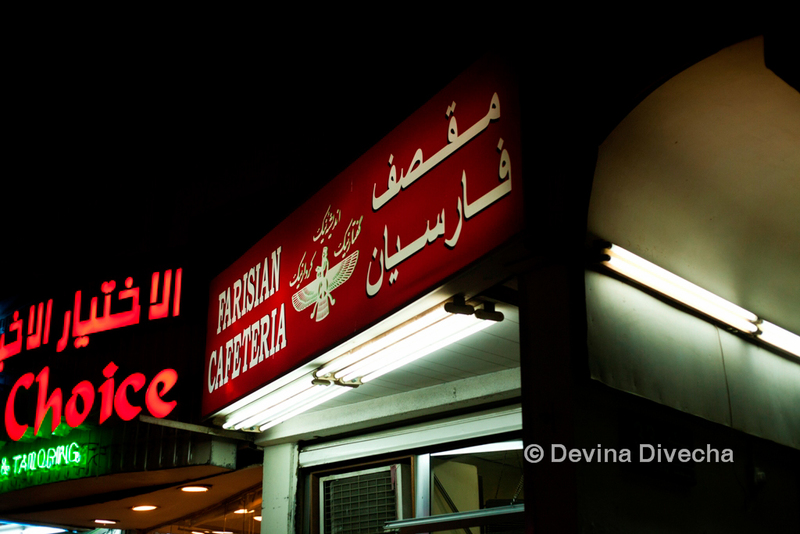 We found a little place called Farisian Cafeteria in the corner, with nothing to say it served falafils. But we asked and we received. 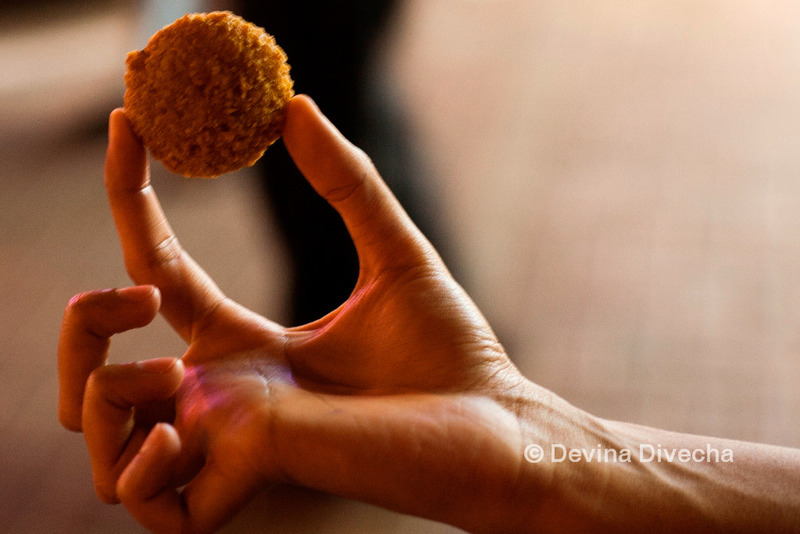 This one was Dhs 1/- per little fritter. And then we excitedly bit into them. It wasn’t as green (which I think comes from the parsley) as many restaurants do it, but it was a pretty good combination of crispy and soft, and my falafil expert deemed it to have a perfect consistency inside. We found it slightly sour; more so than other places we’ve tried before, but that’s a taste issue more than anything else. We decided this place had pretty good stuff [Location]. Next stop? Just Falafel. This one was tricky in that we had no idea how to get there from where we were, so we just stuck to the GPS. We got to the area and actually walked past it before looking back and seeing it snugly tucked away in a corner. An excellent value-for-money offer, we got 9 pieces for Dhs 4/- with its recognizable green and yellow packaging. When the server realized we were going to sit there, at least for a while to munch on them little chickpea globes, she gave us a kind os spicy minty dip, which we used. My, oh my, did it add a nice spice kick! What Farah called a mature taste, these falafils were really, really good. A nice crunch to it, it tasted good on the inside. I’m guessing the dip added a kind of sub-continental flavour to the food [Location]. 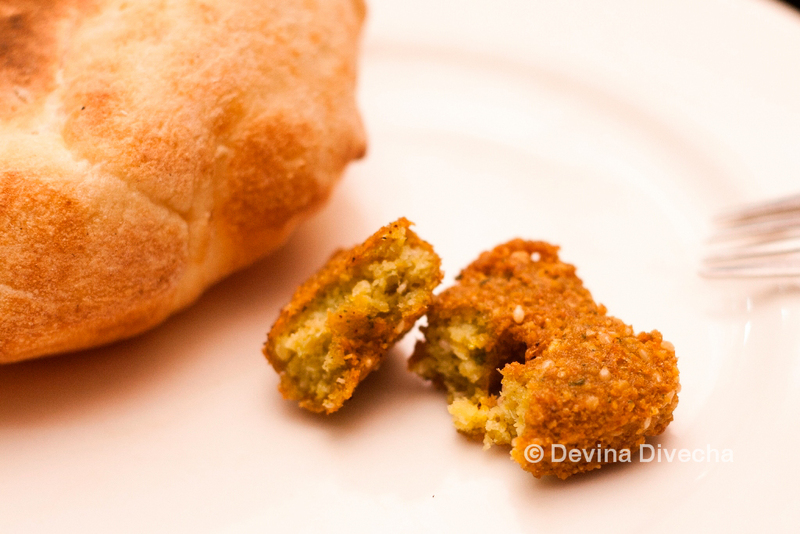 So far…three places’ falafils had been tasted. We headed from here to the very busy Murraqabat Street in Deira. 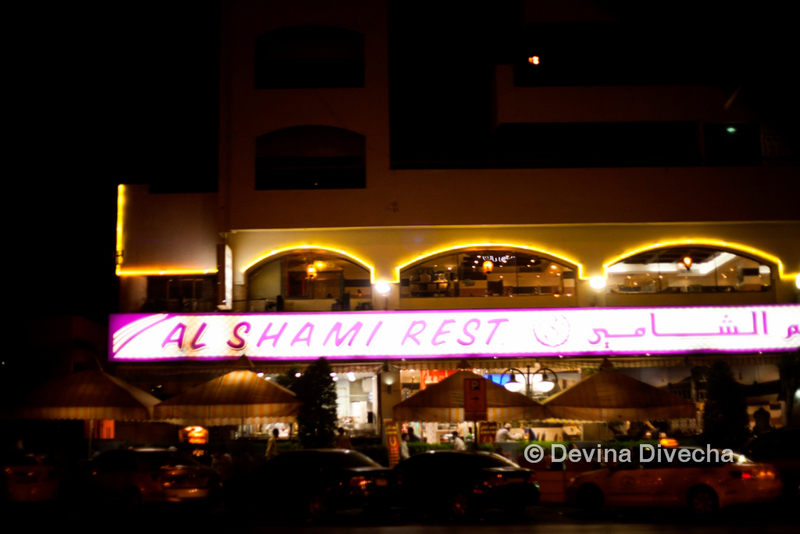 Our first stop was Al Shami Restaurant. 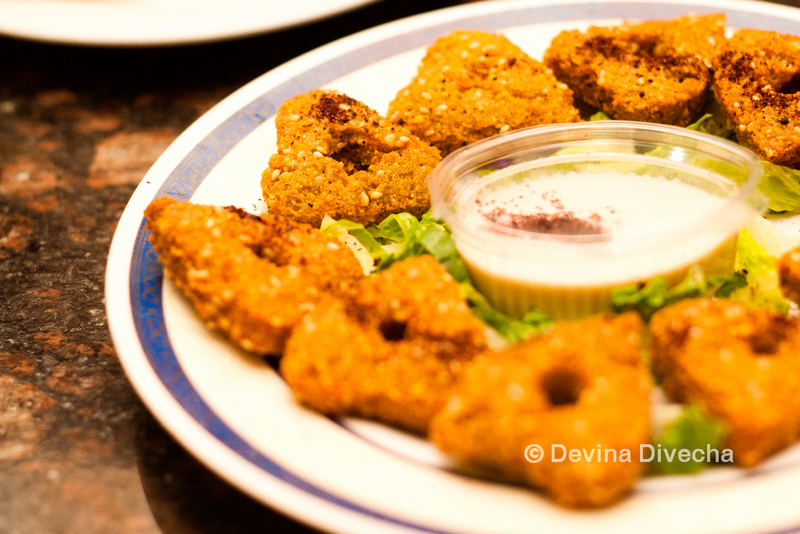 Over here, we got 10 pieces of falafils, with a yoghurt-based dip (this wasn’t tahina) and salad AND fresh, hot bread. 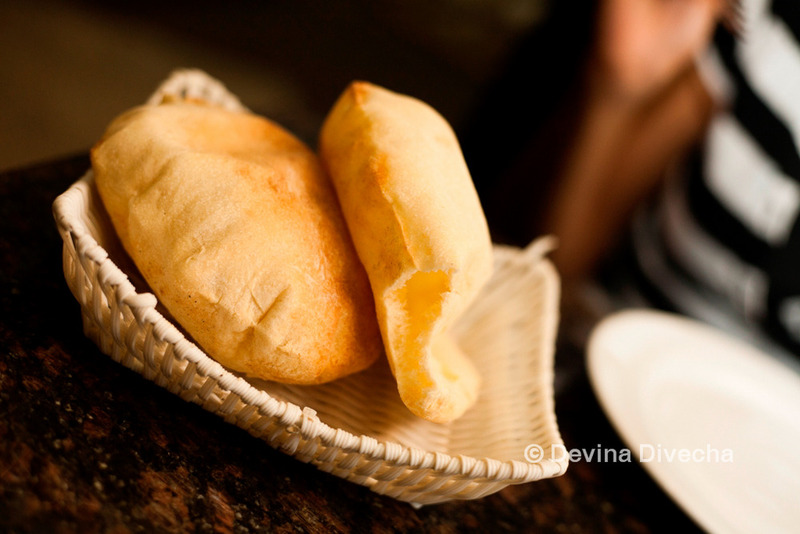 The bread was served to use fresh by a man carrying it in a bread basket, asking us when we quickly finished what he’d first put down, whether we wanted more. 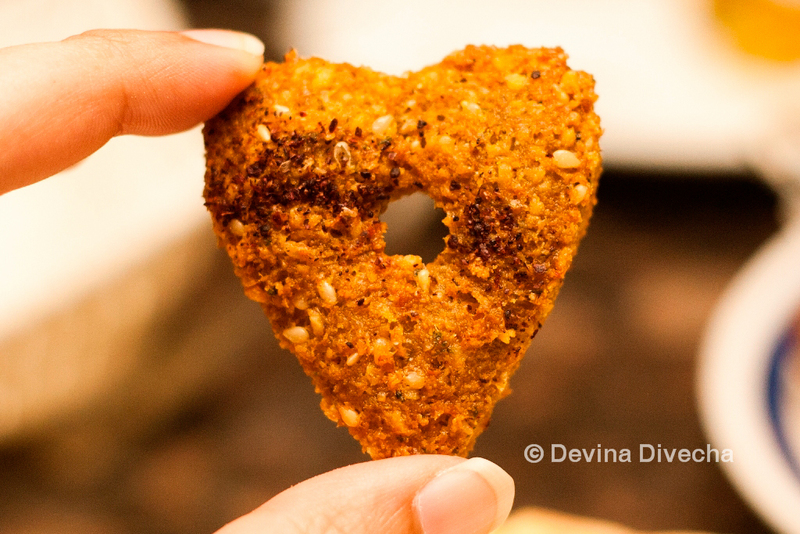 And look…the falafils are heart shaped! These weren’t, for some reason, as hot as the others were that night. But was the taste good? Yes. And it helped that the price included the added extras that I did not expect. The ability to combine all these things into one, very reasonable price point, was appealing. And it helped that the taste was excellent [location]. Next. 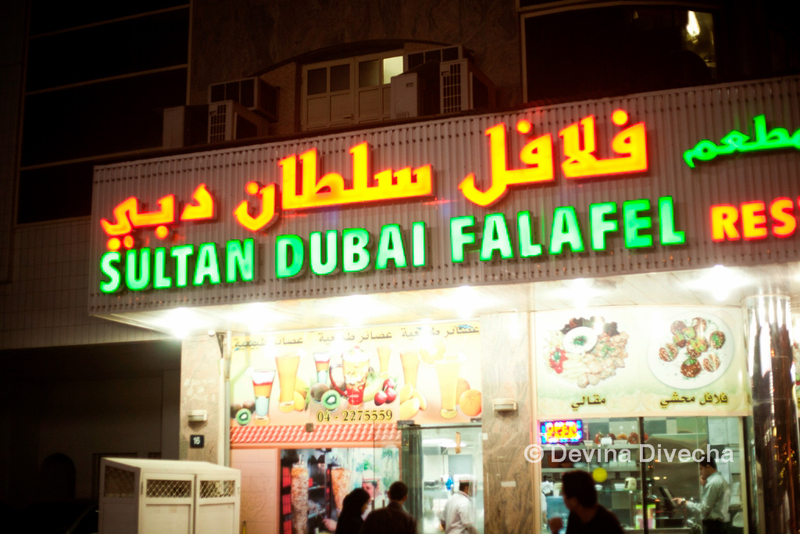 Sultan Dubai Falafel Restaurant. I stupidly forgot to write how much we paid for this, but I vaguely remember it being very cheap – we bought just 4 falafils (I want to say Dhs 1/- for 4, but don’t quote me on it!). It was extremely hot and crispy as we got it fresh from the fryer. Personally I didn’t like having a falafil that was uber-green inside (I meant taste-wise; I have nothing against the colour green!) which is why I preferred some of the others over this. But if you like your parsley and your coriander, then this one might work for you [Location]. By this point, we’re groaning (because we were near stuffed-point) and literally dragging ourselves across the pavements of Deira, as curious onlookers watch me flash the falafils to oblivion. When your stomach is full and you can’t take any more…what does a dedicated food blogger do? WHAT, you ask?! One more, I pant. One more falafil joint, I say. 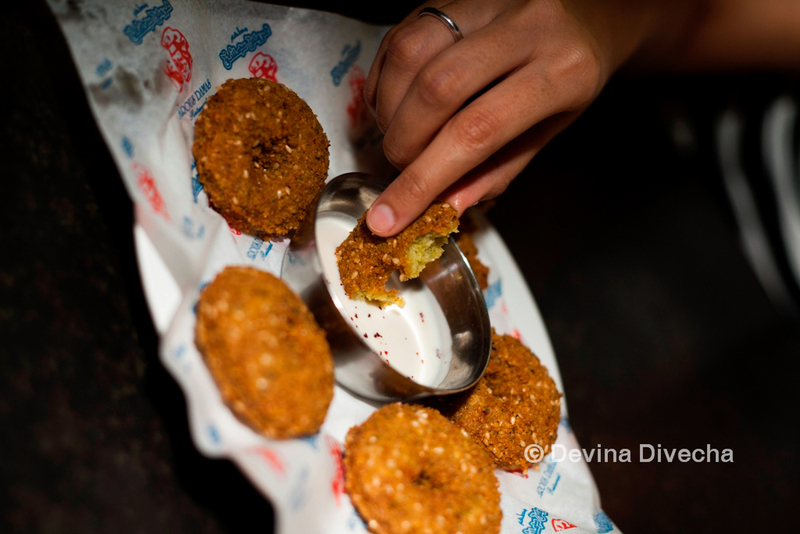 Just one more…come on, let’s get more falafils in the food blogger’s system. ONE MORE! It’s to Farah’s credit, and her love for falafils, that she agreed with me. 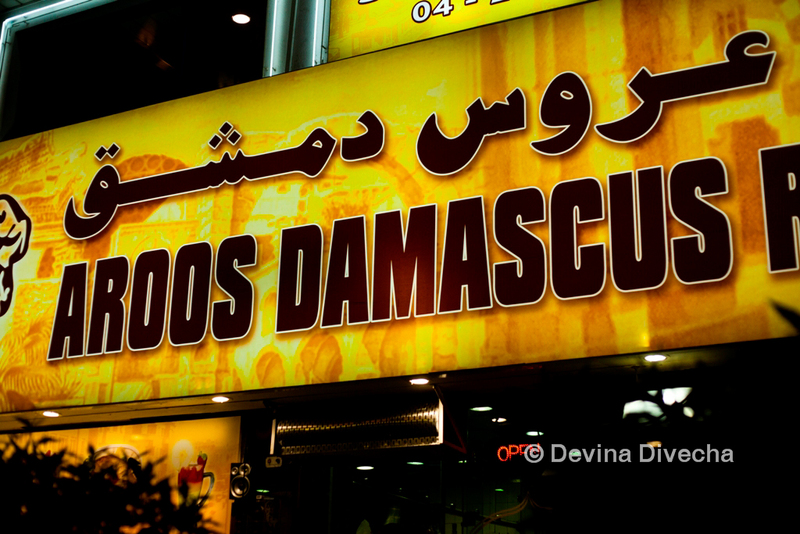 Just down the road…Aroos Damascus. Again I notice I did not take note of the price, but Farah reckons in her post-falafil haze it might have been Dhs 1/- per piece (again, don’t quote us on it). The falafils were good, again with a dip. These were big, round ones, with a hole in the middle like a mini donut. We’re not sure what it was, but we felt a gingery-garlicky taste crop up while biting into it, but other than that, everything else about these falafils was good. Farah deemed this to be on par with the Farisian falafil beauties [Location]. As we walked back to where we parked my car, groaning…she said: “Devina, my mouth is bruised.” What can I say? 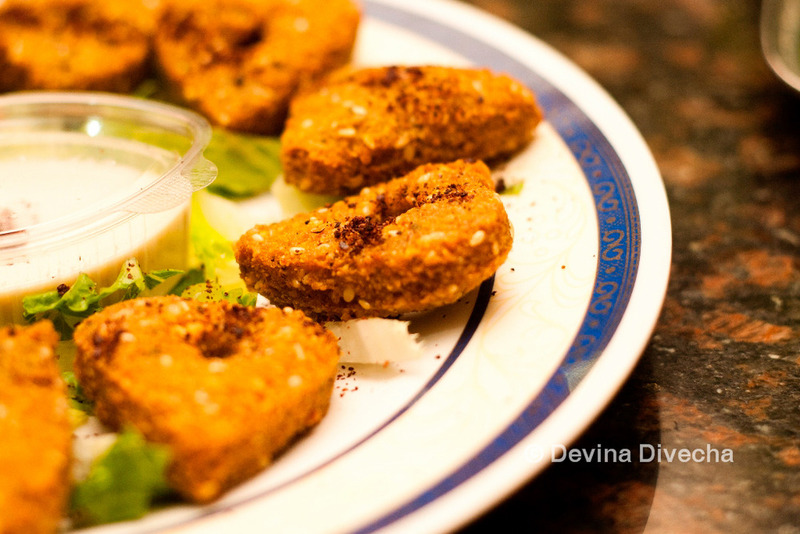 We were determined to find some cool falafil restaurants that weren’t the run-of-the-mill choices for everyone’s falafil fix. So whether you spell it falafil or falafel or any other way I don’t know about, there are plenty of places in old Dubai to get your chickpea (and occasional fava bean) fix, apart from the usual and more well-known suspects. 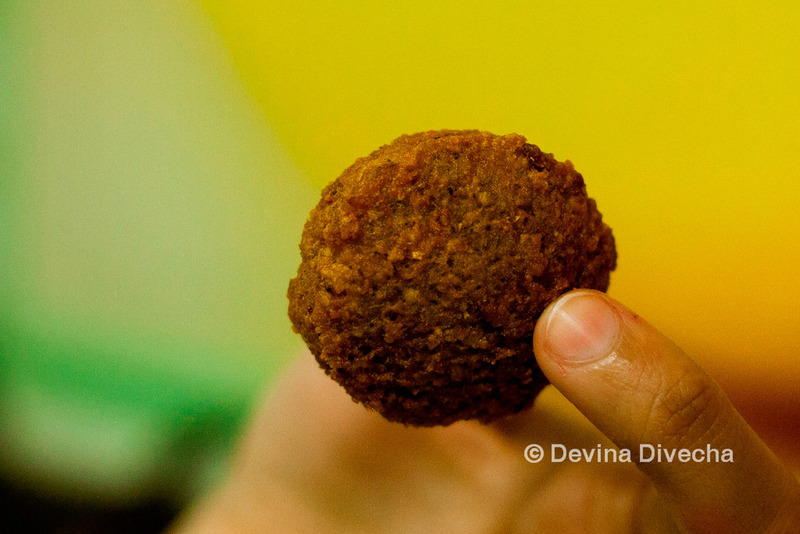 Where do you get your favourite falafils/falafels/whatever from? I’d love to know and try it out if I haven’t already! Looove this post! Kudos to you guys for stuffing your faces with falafels, and I can’t believe those heart shaped beauties are just steps from my home! I was planning to do a hummus and falafel post about this place in al Quoz, so stay tuned, not sure if it’ll stand up to the ones you’ve tried, but no harm in trying! :)Great post! I always wondered which falafel place was worth trying. Now I know where to start – thanks! Great post Dev! Been wondering what that food crawl was about. Haven’t tried Hummus Wa Falafel or Farisian Cafeteria (I will after reading this now), but Al Shami and Aroos are two of my fav Falafil joints. Just Falafel was hit and miss when I tried the Barsha outlet.Two others you should try are Dukkan Falafel (which I recently discovered thanks to @mich1mich) and Al Mallah on Diyafah, an old school favourite of mine. 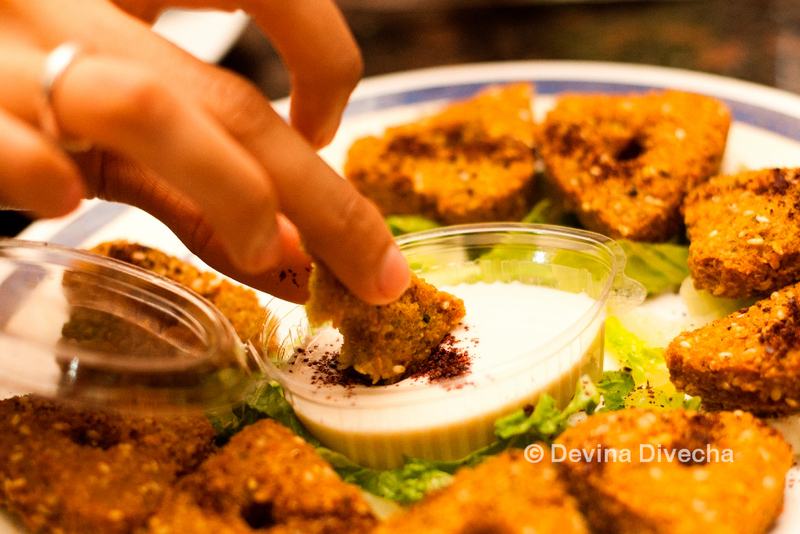 Love this post and thanks for so many great falafel tips! Will have to visit some of these places now! Interesting post – have to try some of these joints! you must try Dukkan Falael though! both their fritters and falafel sandwiches are great! Arva (@inafryingpan) – Thanks! Yup, it was a great effort by both of us and I think we did well 😉 I never knew about Al Shami either but Farah’s to be credited with telling me about this place. Oh yay, Al Quoz is near me…want to hear about another hummus and falafel place. Waiting on that post! Irini – Glad you liked the post, and also glad it’s helping! I didn’t go to the “usual” places people wander to if they want to try falafels. 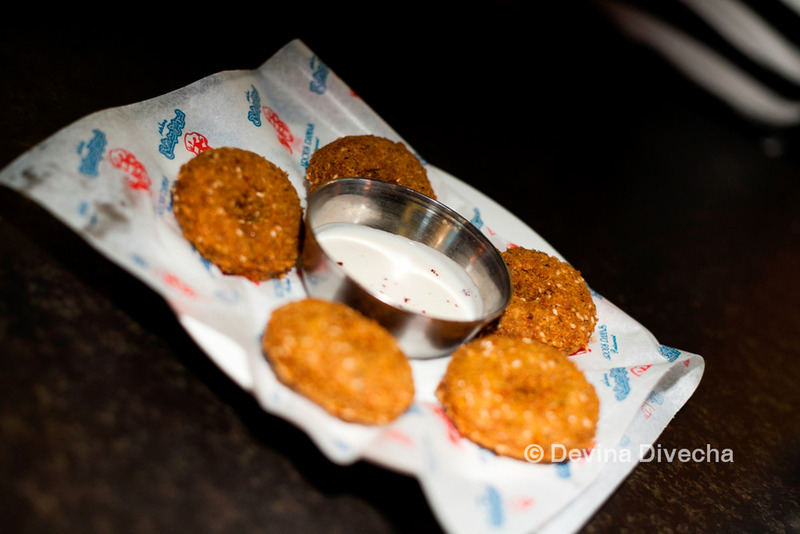 You can also try those out – like Al Mallah in Diyafah Street or Dukkan Falafel. Thanks for commenting @DerrickPereira 😀 Good luck finding Farisian…I think my marker on the map is right but it was insane just trying to get there! Near Al Fahidi Metro Station; easier than parking methinks. Dukkan Falafel is near my house actually…go there quite a bit. Al Mallah…cannot forget it, but like I’ve been saying…this post was all about avoiding the restaurants that everyone thinks of first! Thanks Angela! Glad you liked it. If you do try these places out, let me know how the experience went. Before i even read who your ‘partner’ was, why did i already know it was going to be Arva? :D it had to be, i suppose. Great post! 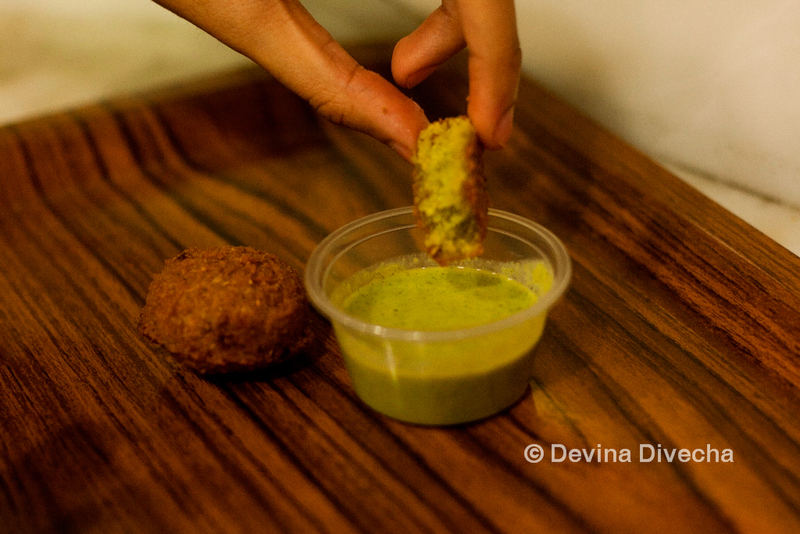 For people like me who are 99.87% veg, falafels are great weapons for suppressing kebab cravings. And i really like your pictures, esp the shot outside ‘moments’- these bicycles are so characteristic of Dubai! Yes Farah…I’ve been really diplomatic 😉 Yup, I know you did. I did too and I’m pretty sure I said it was excellent value-for-money. @didpaterno Hahahahaha “poor man foodie fix”…nice one. Oooooh I must try this place. Is it in Barsha near where you live? I haven’t tried this place…will do so soon. Thanks for the tip! Thanks @vegtastebuds! I had loads of fun going on it, so I’m glad people are enjoying the post. Ooooooh I should’ve just asked in FiA if anyone knew the exact location of Farisian…but the getting lost bit was just part of the adventure I guess. Ahhh didn’t realize they do samosas…will give that a try another time :)And yes, the heart-shaped ones were probably my favourite from the night…must-try. You are now my official ‘most favorite food blogger’! No one ventures out on such a brave food adventure like you do. I’m also now officially craving for felafels – the closest one to me right now (and every work day) is B2B. Fabulous pictures! 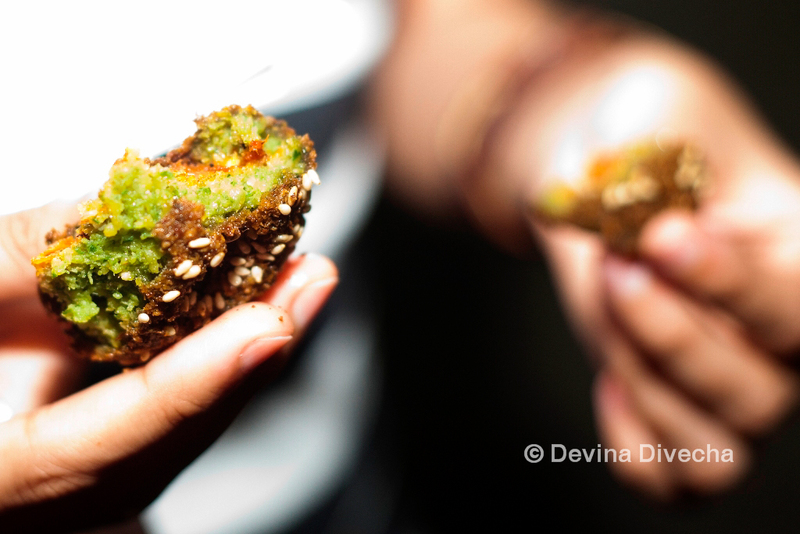 Love your documented journey to the perfect Falafel! 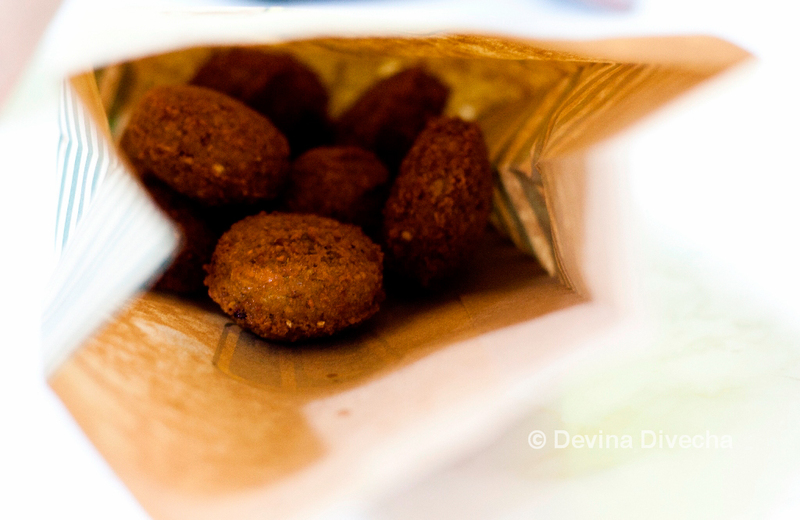 Egyptians make really great falafels here in Cairo, you’d love them! Thanks Londoneya! Oooooh so many places, so much food. 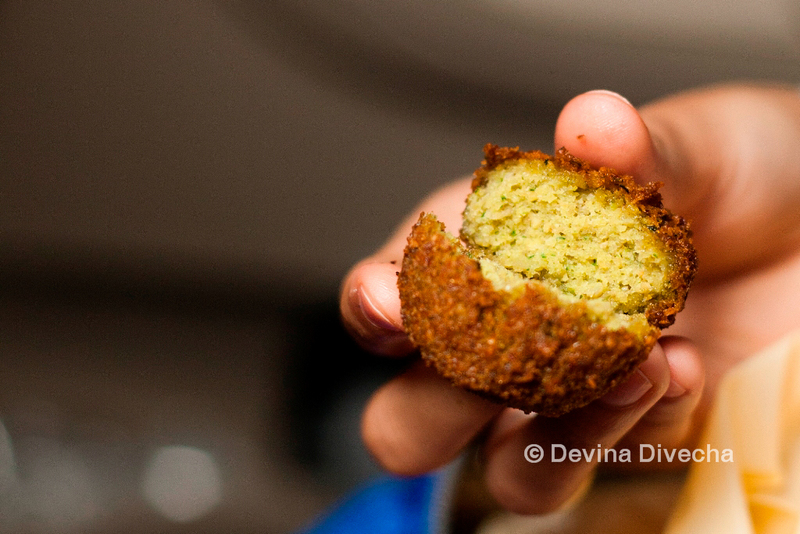 When/if I visit Cairo, I shall definitely try out them falafels. I was actually looking at some package deals a few days back to Egypt with a friend…so it’s definitely something on my to-travel-to list! Sounded like a great falafel adventure! I had the just falafel 2 weeks ago as a midnight craving! I miss it and cud kinda taste it when i went thru ur post!! I want the heart shape ones..Looks too cute! Lovely post and gorgeous pics as usual!! Very nice.. hahaha i love the heart shaped one.. i would buy those mainly because of that. this post brought back memories of the shawarma run I had done before heading out for my vacation… which reminds me.. gotta do a post soon. Drina – Ooooh shawarma run! How many joints did you manage??? I wanted to do one myself but was freaked out thinking of how many shawarmas I could really eat in one night! 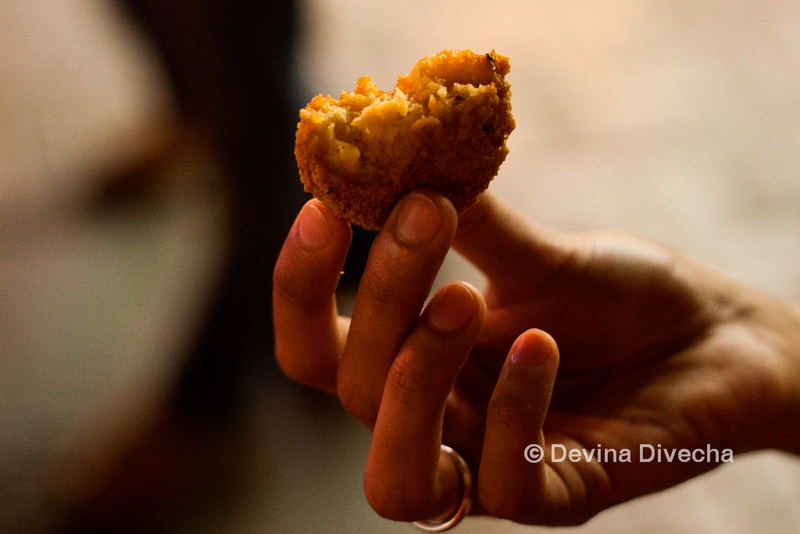 I obviously need to do this trek – falafel (or falfil!) has been something that some people get into, but just not me. I’m starting to think I haven’t had it done properly. That shot of the stripy bag and the sound of the minty dip sounds very appealing – I’ll give it a go! That pictures of food makes me so hungry. I really enjoyed falatels in New York. it was so crunch and faovry, I wish I could have a secret recipe to make them! I would like to test myself in making them, though most of time cooking! Thanks for stopping by Aram. People do make falafels at home…I wish I had the courage to try myself 🙂 If you do try it, let me know how it goes.